Budapest is unique in that it affords its visitors the opportunity to visit two cities in one: Thanks to the Danube River that the city straddles, it's home to both Buda, situated on the hills, and Pest, located on the plains. There's a unique concentration of art nouveau architecture here, alongside stunning thermal bath and spas, remarkable views, and more. Budapest is blessed with very pleasant weather in April, as temperatures warm and tourists increase. It's easy to walk around the city this month, so if you're hoping to see the city's many heritage sights and landmarks by foot, there are few better times than during spring. One of the best ways: Relax at one of Budapest's many cafés, coffee, cocktail, or glass of wine in hand. While that can be difficult in March or winter, April is divine. Luckily for travelers, temperatures in Budapest will increase throughout the month, finally reaching highs closer to 66 degrees Fahrenheit (19 degrees Celsius) by April 30. The days also increase in length throughout April. After a long dark winter, you can expect an average of 13 hours of daylight in Budapest in April, as well as increasing sunshine. April is the sixth sunniest month of the year. As for rainfall, Budapest receives 1.5 inches of rain spread across 13 days. Most rain is light-to-moderate, with occasional thunderstorms. It's unlikely that rain will mar your trip, but it's good to pack an umbrella just in case. Bring comfortable walking shoes and clothing that is appropriate for both cool nights and warmer days. In preparation for the occasional rainy day, a light trench coat or rain poncho is a must-pack, as is an umbrella. You want to be able to layer clothes as necessary, depending on the temperature. It's still cool during the day, so bring closed shoes for walking and a nicer pair of flats or low heels for evening outings. Given the massive improvement in Budapest's weather in April, visitors will delight in the return of street fairs and other outdoor festivities. The Budapest Spring Wine and Jazz Festival: This event marries delicious food, fine wine, and great jazz music into one event. Easter: If the holiday occurs during the month of April, look out for Hungarian Easter traditions, which will take the form of souvenirs, edible treats, and decorations. The Vajdahunyad Castle Easter Fair, in particular, hosts a giant Easter egg exhibition. Vorosmarty Square, well-known for its Christmas market, also hosts an equally-popular Easter fair. Budapest's Spring Festival: The end of March and start of April rings in one of the year's most popular events. This two-week festival includes classical and folk music events, theatrical, and dance performances, as well as contemporary art exhibitions. There's usually a different theme each year. Szechenyi Spa and Baths: Budapest's famous spots host a wild party every Saturday night in April. The dates can vary from year-to-year. Oldtimer Show: Budapest typically hosts this event each year in April. This unique, two-day event takes place in mid-month and celebrates antique automobiles and motorcycles. Budapest Art Week: Started in 2016 as a way for the city's art lovers to discover new modern and contemporary artists, the week-long event includes more than 60 artists and exhibitions. Budapest's April weather is perfect for walking, so explore some of the city on foot. 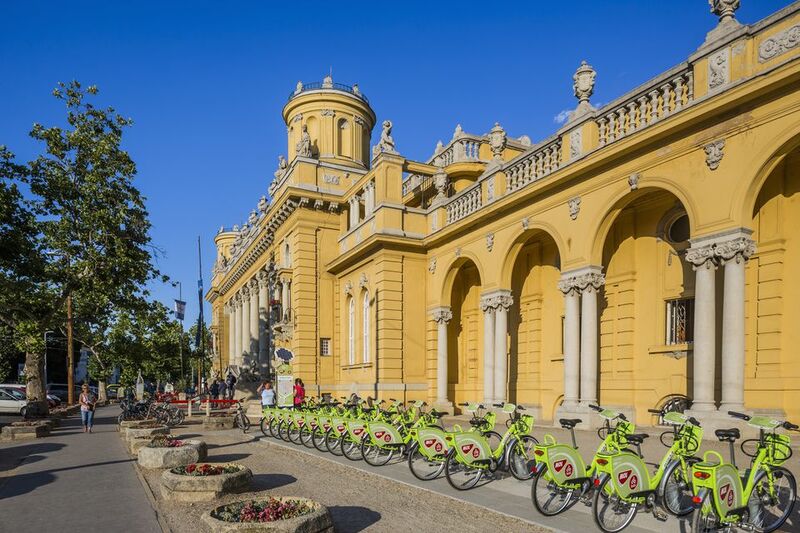 You'll get a greater appreciation for the beauty and character of the Hungarian capital city. Don't miss Budapest's incredible Opera House during your visit. Considered one of the best Neo-Renaissance structures in Europe, it's not a sight to be missed. Open in 1884, it's still possible to tour the opera house during the day or enjoy a concert by night. If the weather is warm enough, take a cruise along the Danube River to take in some of Budapest's most popular sights.